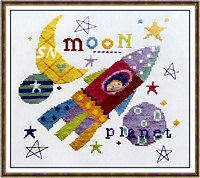 Lift Off -- Wow... this is darling! We don't see too much rocket and moon themes... so any little stargazer would love this one -- especially if you name that planet after them! 9 x 9. Woodland -- Too cute, I love that fox, squirrel and hedgehog -- again, different animals that we're used to getting! 8 x 9. Pretty Garden Sampler -- Just what it says! 9 x 6 in size, there are only 10 colors in here, but because they are scattered it looks like so many more. 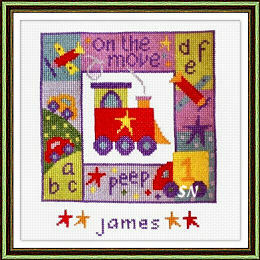 Cute to add buttons or beads to this one! 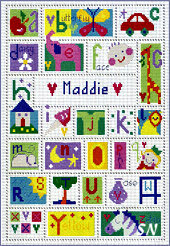 Alphabet Sampler -- 8-1/2 x 11-1/2, This is an old-fashioned type of design... something to count down every night right before (little Maddie) your Guest-of-Honor tucks into bed! Another one that can handle cute button additions! 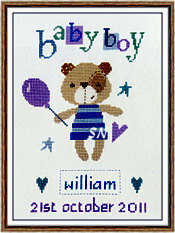 Madison Baby Girl and Boy -- A pair of tiny birth announcements, I think it'd be cute to put the baby's name up there instead of Girl or Boy... and this would be darling stitched and then attached to a baby blanket. Change around the wording at the bottom -- these finish approx 6 x 6 without it. New from The Stitching Shed! 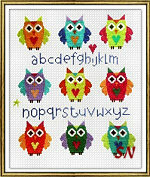 Talk about cute and colorful designs of whimzy! Direct from the UK... we have a fresh shipment of endearing designs that BEG to become part of your stash!!! All offered as charts, each is coded for Anchor Floss. It's an easy fix to go on-line and find color conversion charts... but the pics are so good on these covers, that you might be able to match the colors you have to the pics! 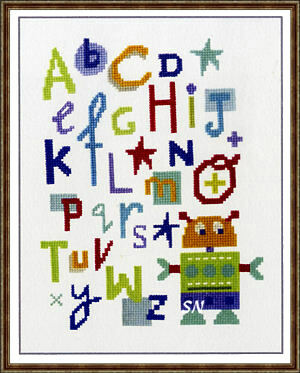 Robot Alphabet -- 7 x 9 -- This would be cute hanging in a little boy's bedroom, with his name on it! You could even re-arrange the letters for a name on a door sign. 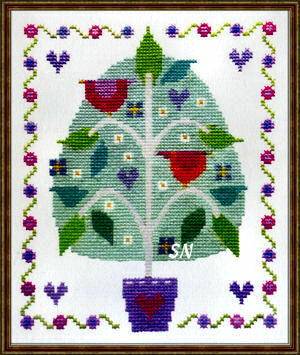 Tree of Love -- 5-1/2 x 7 -- The colors in this are so soft and pretty! Do just the tree and mount it onto a plant poke! 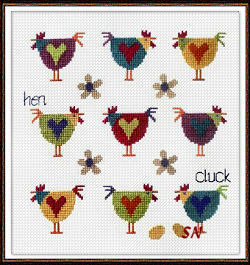 Just like the Owls and Cupcakes... this one features chickens of every color. They can't make up their minds which way they want to stand! 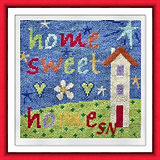 8 x 8-1/2 in finished size, just darling!!! 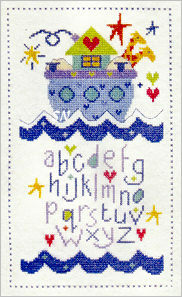 Approx 9-1/2 x 11-1/2 in size, how can something so simple be so cute!!! Stitch one of all of them! Perfect for the Birthday Girl!!! 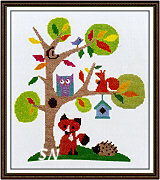 Finishes approx 5-1/2 x 8-1/2, don't you just love the colors? 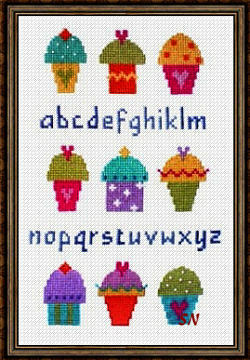 Add a few bead sprinkles for decoration! 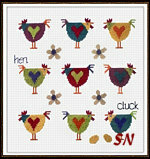 6-1/2 x 6-1/2, This follows the same color scheme as the little chickens above! Wow... talk about fun circus and zoo animals! Everything is in here! 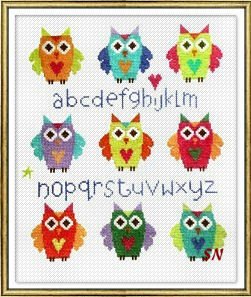 Finishing approx 8-1/2 x 9, it'd be a cute nursery wall decoration! Well, the verse says it all! 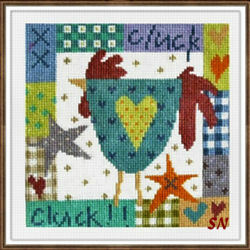 finishing approx 7 x 7, this one would be cute with some hand-dyed flosses tucked into the grass and sky. For the boy... each of these finishes approx 6-1/2 x 7. You could leave off the words at the top and personalize these if you'd like... you could even leave the stitching out of the middle and insert a photograph -- just like a stitched photo frame! These two are shown glued to the front of a paper greeting card... so these charts comes with their own paper card and envelope. Finishing a bit under 5 x 7... 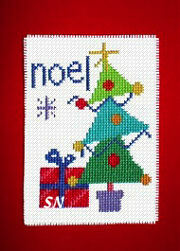 I think these would be cute displayed on the card -- in MY OWN HOUSE! 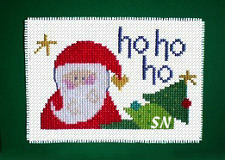 I don't think I'd stitch these and actually mail them to my card list!!! Maybe someone special, though!!! 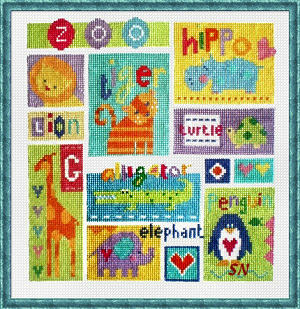 All the way from England, we are charmed to present a cheerful and perky Noah's Ark piece that is bursting at the seams with animals and happiness! 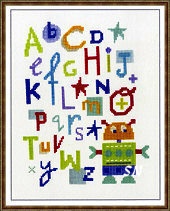 In her light and whimsical style, the colors are clear and pretty, you just can't help yourself... you smile! 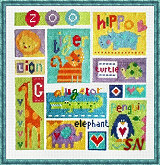 The Ark sampler features the alphabet below the ark, so you can include that, or personalize, using the letters as your template to announce a special baby arrival... ! Offered as the chart, Ark finishes approx 7 x 11 on 28ct.